After having solved the previous error with .Net, updating my version of Windows, I present this error when starting your program. SharpDX.SharpDXException: HRESULT: [0x8007000E], Module: [General], ApiCode: [E_OUTOFMEMORY/Out of memory], Message: No hay suficientes recursos de memoria disponibles para completar esta operación. I see your video card is listed as "Microsoft Basic Render Driver". That means you don't have the vendor's driver for your video card installed. Please install the latest graphics driver. 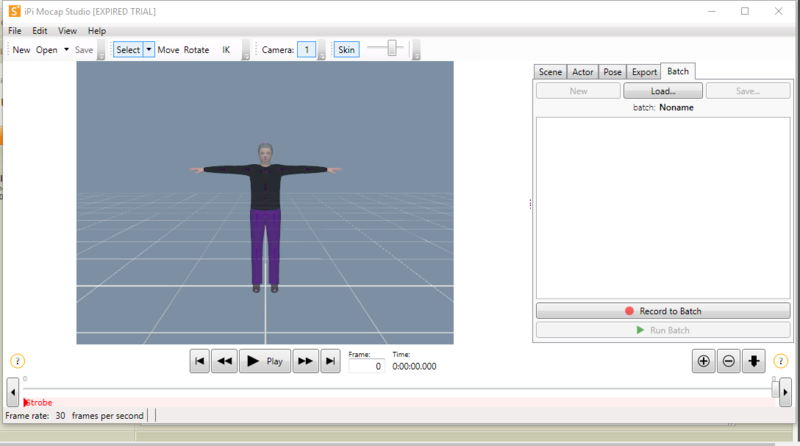 How can I export videos from iPi Recorder X in version 2.x of iPi Mocap Studio? Will there be a version 3.x or 4.x that does not require Direct 11? I kinda doubt they'll support it. The Geforce 8400 series came out about 12 years ago, which is pretty old by computer hardware standards. Would it be possible to upgrade the card? A recent Geforce card isn't necessarily expensive. Just make sure the specs are compatible. No, we're not going back :) Our software relies on some new features in DirectX 11. FYI even if it worked you'd get too low process speed with it. Practically any modern card will perform better. 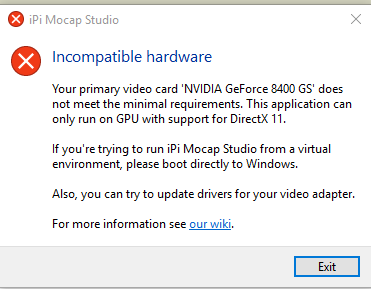 Ok, will I acquire a card that supports directx 11 this month, also supports directx 12? I don't think 2.x is available for new users. The installers are online as a courtesy to users who purchased this version years ago and still have their licenses. If you're testing Mocap Studio for the first time, you'll want to download the latest version. When you first install it, the sofware will be in 'trial' mode and you'll get all the features of Basic for 30 days. 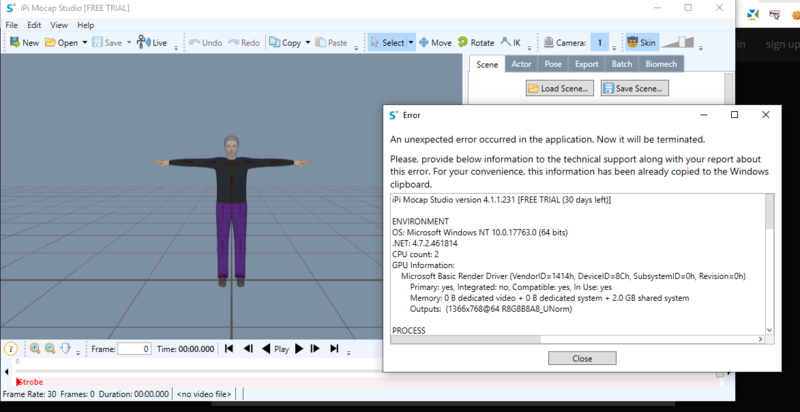 After that period is over, you can use Mocap Studio only in 'demo' mode which does not export data. At this stage, you'll need to buy a perpetual license or a subscription to gain access to all the features again. Obviously, you should avoid activating the trial until you're ready to start testing the software. If you're testing Mocap Studio for the first time, you'll want to download the latest version.